Foggy trip to Charleston, S.C. It rained most of the night last night. Our anchor held tight in Graham Creek and the night was uneventful. Today offered another scene as we not only motored through rain all day, but also fog. The fog was not as bad as the day we experienced it on the Chesapeake Bay, however it made today’s travel an exciting journey. At times it was hard to see the next mark (route signs in the water), but the GPS helped tremendously and we made our way to Charleston, S.C. We feel like we’ve really accomplished something spectacular by making it here in the fog. We even had a swing bridge to navigate through with the fog and we did it!!! We saw quite a few dolphins today. I tried to get a picture for you, but it’s nearly impossible to do so. I’ll keep trying. We are at the Charleston City Marina near the historic area of Charleston. The captain gave the galley slave shore leave and we ate at the marina restaurant. Fried alligator was offered on the menu and since neither of us had ever eaten alligator before, we tried it. It tastes a little like chicken and has the same texture as chicken. It had a sweetness to it and the server said that was from the marinade. He said if alligator is not marinated, it is tough. I can’t say if I see it on a menu again I’d order it, but now I can say “I’ve eaten alligator.” I also tried something else I’ve never eaten before and that is boiled peanuts. Can’t say I liked them. They are mushy. I prefer the regular ol’ crunchy ones. The weather report for tomorrow is promising thunderstorms. We will probably sitesee anyway, even in the rain. Unlike traveling on land, traveling on the water is much friendlier during nice weather. So we actually prefer being at a marina and doing the siteseeing in the nasty weather and save the good days for travel. Last night was an unusually cold night for this part of the country, with the temps dropping to the high 20’s. We could see the vapors of our breath again this morning when we awakened. We’re warm enough to sleep with two down comforters and the two of us snuggled close together. (Ladies, would you ever think there could be a time when you actually appreciate hot flashes? This is it!!! They are a welcome malady during the frigid nights when we have no heat on the boat.) Everyday I see men sailing down the ICW without a partner, and I think of how much colder they must be than we, without having another person’s body heat to help keep them warm on these below freezing nights. Personally, I can’t imagine this trip without someone to talk to. Gary and I are so fortunate in that we truly enjoy each other’s company. It’s so nice to love, and “like” your partner. We are each other’s entertainment. Ask him to sing “Oh What A Beautiful Morning” for you the next time you see him. It’s a riot. We “crack each other up” sometimes with our antics. For example; the creek we anchored in last night is called Cow House Creek. When I heard the name of it, I let out a moo that would have frightened any cow out of it’s mind. It was so bad, Gary asked me to do it again. I embarrassed myself so much, and laughed so hard, I didn’t make a second attempt. It really sounded more like a cow in the middle of birthing a calf. We are laughing again as we’re talking about it as I write this for you. If this sounds trivial to you, remember we have no TV. We are our own comedy/reality show… We have always said, our life together would make a good TV show, with Gary almost dying in 2000; our romance, etc. and now this adventure. It would offer everything a good movie requires: suspense, drama, romance, and a happy ending. You are either saying, “Ah-h-h-h-h…” or “Gag me with a spoon….” Oh well…. Today, our journey consisted of mostly motoring through rivers and canals. The canals in this section of the ICW are through marsh and there is not a whole lot to look at. We did see a lot of egrets, pelicans, and a few blue herons. We’ve been disappointed in not seeing more waterfowl, but we realize it’s just too late in the season to see a lot this far north. We are seeing more dolphins now, which always add excitement to our day. We saw something else that was interesting, a manmade (person-made) houseboat of the strangest kind, supposedly eco-friendly. Describing it would not do it justice, so please just look at the photo in the Photo Gallery. Presently, we are anchored in a marsh, up a little creek called Graham Creek, just off the ICW. There is no protection here, which we would prefer in case strong winds arise. But, none of the anchorages in this area offer protection, because it is all marsh. We are now 440 miles south of Norfolk. We traveled 55.5 statute miles today. The current and the wind were both behind us giving us a push. 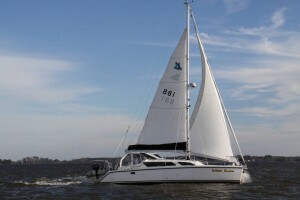 Tomorrow we should arrive at Charleston, S.C. We plan on staying there a few days to site-see. Gary’s father lived near Charleston for a while, so he has been there before; but, I have not. I’m looking forward to Gary introducing me to the area. Today we logged 45 nautical miles. This is the first day our nautical miles were less than our statute miles. Statute miles are how travel is measured over the land. What made the difference today was we were going against the current almost the whole day. Our route today took us down the Waccamaw River, with lots of bends and turns making it a fun river to navigate. Autumn arrived here much later in the year, as there is still a significant amount of autumn color in the trees and bushes. We are far enough south that the Spanish moss is in a lot of the trees. I remember the first time I saw Spanish moss in trees and I thought it was so interesting and picturesque. There is an eerieness to it and a mystic that makes me think of the deep south and a bayou. There are also a lot of cypress trees at the edge of the water with their “knees” (roots) protruding out of the water, sometimes visible only at low tide. We are anchored up a small creek just off the ICW tonight, which means no heat in the boat. The evening chill is starting to take hold of the inside of White Swan, so I’ll say “good night.” as I go snuggle under two down comforters to get warm and read for awhile before sleep overtakes me. Trying to get out of the dockage area of the Joyner Marina at Carolina Beach, N.C. was a “real trip”. As predicted, the wind died down today, but the current through that part of the ICW seems to remain perilous most of the time, even in the dockage area. I was piloting the boat and at one time, I had the wheel turned as much as it would go and the boat was not turning at all because of the extreme current. I had to abort what I was trying to do and change tactics. I got the boat lined up again going down an alley in the dockage area and started in reverse again at full throttle. I backed out into the lane we needed to be in to get out of the marina and put it in forward at full throttle with the wheel completely turned the way we needed to go, and the only reason we didn’t take out a hull on a dock was Gary physically “fended” us off it. I still hit the dock with the stern, but no damage was done to the boat. That is why I was at the wheel. I don’t have the muscles it takes to manage such a task. This is how the pontoon bridge operated: The section of the bridge that sits on the pontoon (including the Pilot’s house), swings like a swing bridge only the whole section floats right on top the water. If the wind is over 25 miles an hour, it will not open. Our hunch is, this type of bridge will some day be obsolete; so, we were glad for the experience of going through one. At the site of this pontoon bridge, a new fixed bridge is under construction and is to open in 2010. Making it through the pontoon bridge (which is in North Carolina) by 4:00 PM, allowed us to arrive at our intended anchorage for the night (in South Carolina), just before it got dark. Actually, it’s almost 6:00 PM and I can still see the shore. When we started this trip on November 4th, it was getting dark right before 5:00 PM. So we are south enough now that we have an extra hour of daylight. We are still not having constantly warm days yet, but it’s warmer here than in Indiana. And, we don’t miss the snow. We are definitely “snowbirds” now. Thanks again for your e-mails. If I don’t reply right away, know that it’s because we have no cell phone service in whatever area we are in at the time. Galley slave duties are calling me, so this is all for now. We’ve been getting e-mails asking how to leave a comment on this website. To do so, look under the caption for the blog you are reading and you’ll see (in very small print) the date, by Jean,No comment yet (or comment with a number)- click on “comment” when the hand icon pops up and it will pull up a screen where you can leave a comment. We’re so glad you are enjoying our website. We love hearing from you. Last night was the first night we did not need to have heat in the boat to stay decently warm. Nor were we in a hurry this morning to start the boat and turn the heat on. We think we are far enough south now to where this will be the norm. Yeah!!! Today we saw a dolphin for the first time this trip. Gary saw it right at the bow of the boat and then it went down into the water under the boat. After he told me what he saw, I went to the back of the boat and it finally came up quite a ways away from us, but I got to see it too. We made it to Carolina Beach which is where Deborah Levin lives. This is a milestone for us as we feel like we’ve really accomplished something to have actually gotten this far and arrived at one of our destinations. Deborah used to work with us at the office, and when she moved here almost four years ago, we told her when we came down the ICW we would stop and see her. She was surprised that we were true to our word. She and her friend. Bill, showed us around the island which is seven miles long. This time of year, the island is known as “the island of lights”. There is a fabulous display of Christmas lights down the main street. Different than what is seen in the Midwest, with huge lights on all the lamp posts of a nautical theme: seahorses, conch shells, anchors, swordfish, dolphins, sailboats, etc. There was an assortment of lights around a fresh water lake (the closest fresh water lake to the sea anywhere in the world); and the reflections of the lights in the water were spectacular. There are three beaches on this island, Carolina Beach, Kure Beach (pronounced “Qurrie”), and Fort Fisher Beach. The locals speak of the beaches as though they are really three different towns. Deborah lives in a cottage facing the ocean on Kure Beach, which is phenomenal. Kure Beach has the longest public pier going into the Atlantic Ocean (in the nation), and it is not far from where she lives. Also, a lot of movies are filmed on this island, so it’s not unusual for them to see movie stars. We spent most of the day with Deborah Levin today. She picked us up and took us on a daylight tour of the island, and then to the North Carolina Aquarium. The main attraction at the aquarium was an albino alligator; (see Photo Gallery) but, the whole aquarium was very nice. The islanders are quite proud to have it on their island, and they should be. 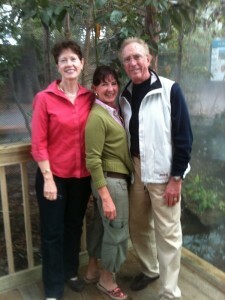 After the aquarium, Deborah drove us to Wilmington, which is 18 miles from the island. Like all the other larger coastal towns we’ve been to, there is a historical part of town- quite picturesque, with the Spanish moss hanging from trees, and huge homes with interesting architecture. On the way back, she took us to a seafood market where we got fresh flounder and red snapper. Then, she insisted we use her car to go to the grocery, etc., which was a gift to these “cruisers”. We met Deborah and Bill at the restaurant that he manages and had a wonderful dinner with them. The food was fantastic and we had a great time visiting with them. It was a fun day. The wind has been gusting up to 50 miles an hour today, with some rain. However, the temperature was in the 70’s. The wind is suppose to be more manageable tomorrow and we plan on leaving Carolina Beach in the morning to resume our trip south. Today we traveled down a natural waterway with a dredged channel that was quite narrow. We had to pay close attention to our piloting of the boat so we wouldn’t wander outside the channel. Once we did just that, but we got a wake-up call when a rudder kicked up, warning us of the peril awaiting those who venture to the wrong side of the channel markers, including shallow drafted boats such as White Swan. We traveled more miles in one day, today, than we have any other day during this trip. We motored almost 51 miles. If you think that is bad, just think of what it must have been like for the pioneers who traveled these waterways. Our boat will motor at around six miles per hour, which isn’t bad for a sailboat. If the wind is behind us, giving us a little push, it’s better. If the current of the water is moving against us, it’s worse. If the current and the wind are both going the same direction as we are, it’s a SWEET ride. It was challenging for us to find our route through Beaufort, N.C., but we inconsequentially did it. The GPS is our lifeline, but we have to consult the navigational charts as well to stay on track in the larger ports. For dinner, I prepared fresh flounder that we got from a little seafood shop in Belhaven. When I say fresh, I mean we picked out the whole fish and we watched as it was filleted for us. I can’t even describe how good it was. My cousins in Kentucky use the phrase, “I’ve floundered myself.” when they eat too much. Now that I’ve eaten truly fresh flounder, I think I know of which they speak. I could have eaten it until I stuffed myself. 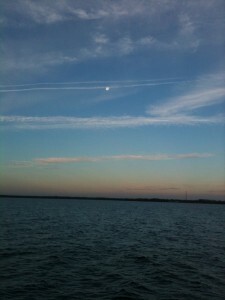 Our stay in Belhaven, N.C. was laid back and relaxing, as are the people of the town. We borrowed a golf cart from the marina and went to the Ace Hardware to look for a fitting for a water hose and moisture absorbent crystals used to help with the condensation in the boat. As much as we are enjoying the journey, the consequence of not being far enough south to not have to use the heater, is MOLD. I’m finding it everywhere. Spray bleach takes care of killing it, but I wonder what it’s doing to us physically. Can’t be good, but so far we have not been ill. For two people who have allergies (including mold) and got allergy shots (for years) when in Indy, we are doing remarkably well. As we were leaving the Ace Hardware, a nice young man overheard us asking directions to get to the grocery store, and offered to take us there since he was going there as well. “Frank” was delightful. He grew up in this town; now lives in Raleigh where he owns a hair salon (yes… and he had very nice stud diamond earrings); he also owns a home on the water near here on the Pamlico River; he is in town for his grandmother’s 100th birthday; and he told us a recipe for oysters that sounded delicious. It doesn’t take us long to make new friends. We are collecting them in all the ports…typical sailors. We can’t download the pictures for these last two blogs because we presently have no cell phone service. I’ll update the Photo Gallery as soon as I am able to do so. We left the Alligator River Marina as soon as it was daylight this morning because we wanted to make it to Belhaven, N.C. today. The sun was rising as the moon was setting and it was absolutely beautiful. The picture below does not do it justice. As soon as we left the marina and got out into the middle of the river, we had a swing bridge to go through. We didn’t know what to expect since we’d never been through one. A section of the bridge pivots 90 degrees, staying horizontal to the water. When it is open it allows two lanes of water traffic to pass by with the pivoted bridge section in the middle of the lanes. It was very interesting. As I said before, I didn’t know there were so many different types of bridges to accommodate water traffic. From the Alligator River, we went onto the Alligator River-Pungo River Canal which connected us to the Pungo River (makes sense, doesn’t it???) The canal was wider than the Dismal Swamp Canal, but the cruising guide recommended boaters stay in the center of the channel because of tree stumps hidden under the water. I didn’t read any history on this canal. The cruising guide mentioned occasionally boaters have seen black bears swimming across the canal. Gary and I were diligently looking for bears swimming in the water and once I thought I saw one at the shore, only to realize it was an old rusted barrel. Dang! The Pungo River was our route to Belhaven. With the wind at our stern (the back of the boat) we had an easy 50 mile journey to our destination. We motored since the wind was light; but even though we were motoring, the wind increased our speed by helping push us along. We are presently tied to a dock at a marina, awaiting more rain that is to come sometime after midnight. We have shore power (electricity) so we have heat and plenty of hot water-things we take for granted in a home. Tomorrow it is suppose to rain all day so we plan on staying here two nights. We will check out the town of Belhaven tomorrow. The marina has golf carts we can borrow to ride around the town. How quaint is that? It sounds like fun to me, riding around in a golf cart in the rain. Just thinking about it reminds me of the time my dad and I were playing golf and got caught in a rain storm-good memory actually. Gary is checking the navigational charts to plan our next day’s journey. That’s the captain’s job you know. Galley slave had the night off and got to have dinner at the restaurant here at the marina. The stuffed flounder with crabmeat was excellent…. We didn’t plan on leaving Elizabeth City today, but the weather report indicated it would be a good day to travel across Albemarle Sound since the wind wasn’t going to be over 20 knots. Our boat sails well in 15 knots of wind and 20 is still manageable. As it turned out, the wind got up to 20 knots providing Gary with a great sail across the 14 mile journey. It was a fabulous day on the Albemarle Sound. The water was choppy with small white caps as we took down the sails and motored into the Alligator River. I don’t really know if there are alligators in this river, and I don’t really want to know. “Ignorance is bliss” so they say. I don’t know who “they” are; but it seems “they” always know what they’re talking about. There is a “swing bridge” right as we leave this marina that we will have to go through in the morning. We‘ve never encountered this type of bridge before, so we’ll give you the scoop on how it all works out in the next blog. It will open on demand, so we won’t have to wait until any particular time to take off in the morning. A lady on another boat took pictures of us crossing the sound and e-mailed them to us. What a gift.